Take a cauldron full of magic, add a pinch of humor, a dash of snark and a huge dollop of m/m goodness, and what do you get? Charmed and Dangerous: Ten Tales of Gay Paranormal Romance and Urban Fantasy. This all-new collection is packed with arcane action and intrigue, and every story will whisk you away to a fantastical world where the hero finds his prince and the paranormal investigator always gets his man. Magic takes many forms. From malignant hexes to love charms gone amok, you’ll find a vast array of spells and curses, creatures and conjurings in this massive collection—not to mention a steamy dose of man-on-man action. 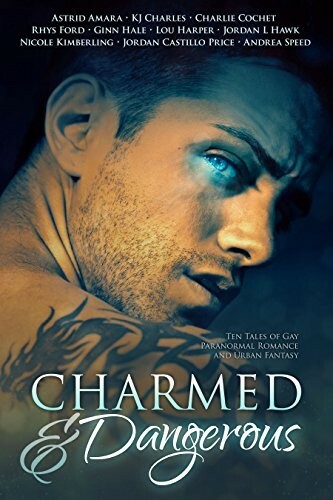 Charmed and Dangerous features all-new stories of gay paranormal romance, supernatural fiction and urban fantasy by ten top m/m paranormal authors. For Detective Roku MacCormick, working Arcane Crimes is his passion. Now cleared of any wrongdoing for shooting his last partner, MacCormick is given back his badge… as well as a new case and partner. Trent Leonard isn’t exactly what he’d expected, but then nothing in San Francisco’s Chinatown ever is. Apprentice magician Crispin Tredarloe returns to London to find his master dead, and his papers sold. Papers with secrets that could spell death. Waste paper seller Ned Hall can’t resist Crispin’s pleading—and appealing—looks. But can the wasteman and the magician prevent a disaster and save Crispin’s skin? Occult attacks against NIAD agents aren’t remotely Keith Curry’s department. But when his lover, Gunther, is assaulted, Keith refuses to just sit back and fill out paperwork. He’s on the case—even if that means enraging powerful mages, crossing leprechaun picket lines, or braving dinner with Gunther’s goblin parents. Psychic medium Victor Bayne can spot a ghost any day of the year, but Halloween holds some special surprises. His psych-groupie boyfriend Jacob coaxes him to the location of an old spirit sighting, but they can’t ghosthunt without enduring a cheesy “haunted house” that’s even more disturbing than they realize. Hexman Dominic Kopecky doesn’t understand why dashing crow familiar Rook wants his help investigating murder by patent hex. For one thing, Dominic isn’t a witch. For another, the case is already closed—and someone is willing to kill to keep it that way. Riley Murrough goes from serving lattes to being chased by demons. If that wasn’t bad enough, he bears the mark of a shapeshifter king from a magical realm. Riley’s determined to get answers, but if the demons out for his blood don’t kill him, the urge to strangle the arrogant king might. Veteran detective Mike Mulligan is an expert on violent crimes—of the occult variety. He might even be cursed. Detective Hugh Fox is eager to partner up and prove himself, but Mulligan is accustomed to flying solo. Can they trust each other enough to track a killer who’ll stop at nothing, not even summoning a demon? It’s a boring night at the Quik-Mart for Josh and his friend Doug. Until a vampire with a grudge—and the most adorable backup ever—crashes the store. Can Josh survive the Bathroom of Doom? P.I. Tim Keller has a problem. And the only person who can solve it is his ex-boyfriend, Vincent, whose job as a hexbreaker was the reason they broke up. It’s hard admitting he was wrong, especially when coughing up organs. But there’s a missing person to find, a hexmaker to hunt down, and a romance to repair before Tim breathes his last. KJ Charles is a writer and freelance editor. She lives in London with her husband, two kids, an out-of-control garden and an increasingly murderous cat. KJ writes mostly romance, gay and straight, frequently historical, and usually with some fantasy or horror in there. She specialises in editing romance, especially historical and fantasy, and also edits children’s fiction. Rhys admits to sharing the house with three cats, a bonsai wolfhound, and a ginger cairn terrorist. Rhys is also enslaved to the upkeep a 1979 Pontiac Firebird, a Toshiba laptop, and a red Hamilton Beach coffee maker. But mostly to the coffee maker. Ginn Hale resides in the Pacific Northwest with her wife and three cats. She spends many of the rainy days tinkering with devices and words and can often be sighted herding other people’s dogs, bees and goats. Her novel Wicked Gentlemen won the Spectrum Award for Best Novel and was a finalist for the Lambda Literary Award. Under a prickly, cynical surface Lou Harper is an incorrigible romantic. Her love affair with the written word started at a tender age. There was never a time when stories weren’t romping around in her head. She is currently embroiled in a ruinous romance with adjectives. In her free time Lou stalks deviant words and feral narratives. Lou’s favorite animal is the hedgehog. She likes nature, books, movies, photography, and good food. She has a temper and mood swings. Lou has misspent most of her life in parts of Europe and the US, but is now firmly settled in Los Angeles and worships the sun. However, she thinks the ocean smells funny. Lou is a loner, a misfit, and a happy drunk. Jordan L. Hawk grew up in North Carolina and forgot to ever leave. Childhood tales of mountain ghosts and mysterious creatures gave her a life-long love of things that go bump in the night. When she isn’t writing, she brews her own beer and tries to keep her cats from destroying the house. Her best-selling Whyborne & Griffin series (beginning with Widdershins) can be found in print, ebook, and audiobook at Amazon and other online retailers. Nicole Kimberling lives in Bellingham, Washington with her wife, Dawn Kimberling, two bad cats as well as a wide and diverse variety of invasive and noxious weeds. Her first novel, Turnskin, won the Lambda Literary Award for Science Fiction, Fantasy and Horror. She is also the author of the Bellingham Mystery Series. Author and artist Jordan Castillo Price writes paranormal sci-fi thrillers colored by her time in the midwest, from inner city Chicago, to rural small town Wisconsin, to liberal Madison. Her influences include Ouija boards, Return of the Living Dead, “light as a feather, stiff as a board,” girls with tattoos and boys in eyeliner. In her spare time, she arms lemurs in preparation for the upcoming war against the Mole Men. Viva la revolution!